Vita Stankovic lives with his wife Sofija Arbanac and their daughters Rada, 5, and Caka, 3, in a homemade ramshackle dwelling. It’s in the middle of a vacant lot but within sight of the new high-rise buildings that mark the post-war renaissance of Belgrade, Serbia. 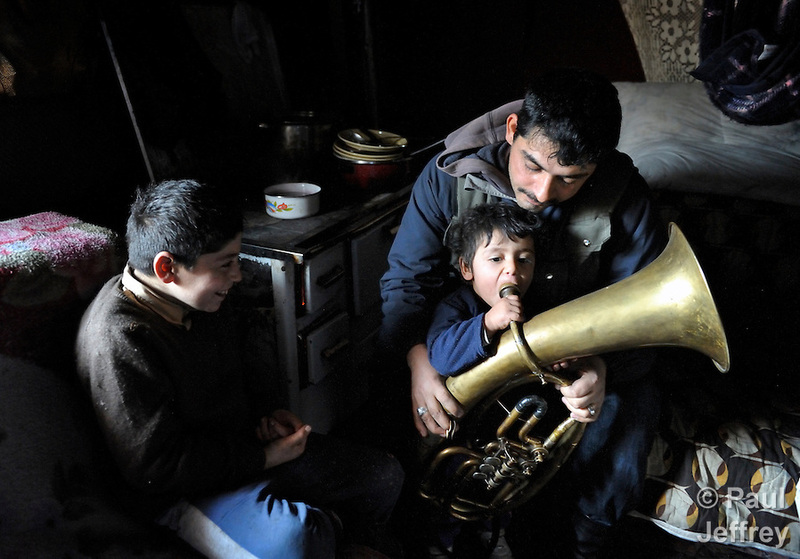 Stankovic and his family are Roma, also known as Gypsies, and live at the edge of a settlement of other Roma families. He earns his living by recycling, working with a friend who has a bicycle-powered cart. They wander the city collecting cardboard, which they can then sell for three dinars per kilo–about five cents. 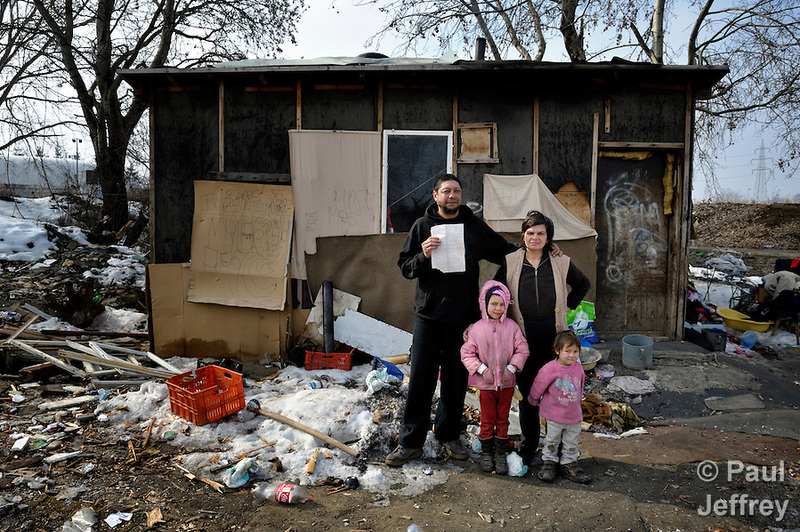 Serbian Orthodox Christians, they received in February a letter informing them that they are about to be evicted. They know the drill. They moved here after being evicted from another site in 2009. Here’s Stankovic and his family outside their home. He’s holding the eviction letter. Stankovic’s experience isn’t unique. The Roma of Belgrade are being systematically pushed off the land where they live in order to make way for shopping malls and high-rise offices. The apartment complex where I stayed in Belgrade was built–just a few years ago–on land where Roma families lived. Amnesty International and other groups have protested to the Serbian government, but the evictions continue. The displaced families go settle on a different vacant lot somewhere, or are pushed into the countryside, while some are provided with shipping containers in which to live. (I went to visit some families living in the containers, and I’ll cover that in articles I’ll write.) 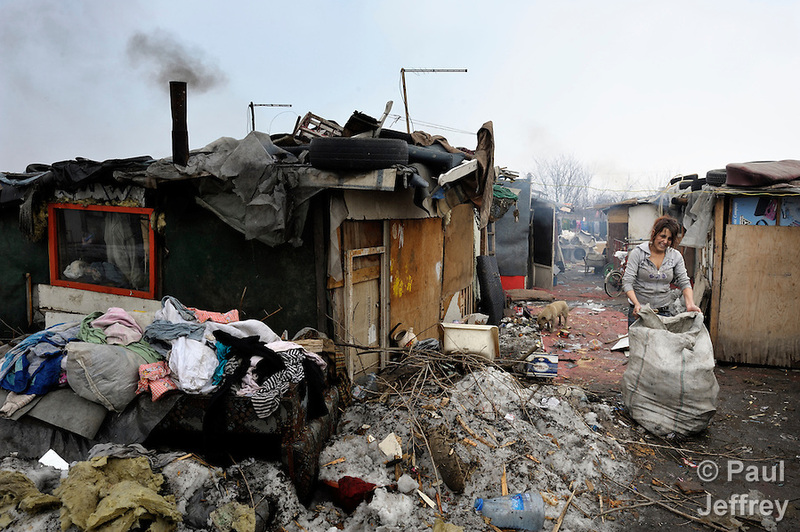 The housing crisis is part of a larger context of anti-Roma violence in the Balkans and elsewhere. This is nothing new, and attacks today on Roma by neo-Nazi skinheads are just a reminder of how more than 200,000 European Roma perished in the Holocaust. I went to Serbia to start researching Roma life in order to write about it next year for response, the magazine of United Methodist Women, whose summer mission schools will have the Roma as a theme in 2013 and 2014. Unfortunately, the timing of my trip was such that I arrived just as a major winter storm came to an end. Unseasonably cold temperatures had lingered for weeks. 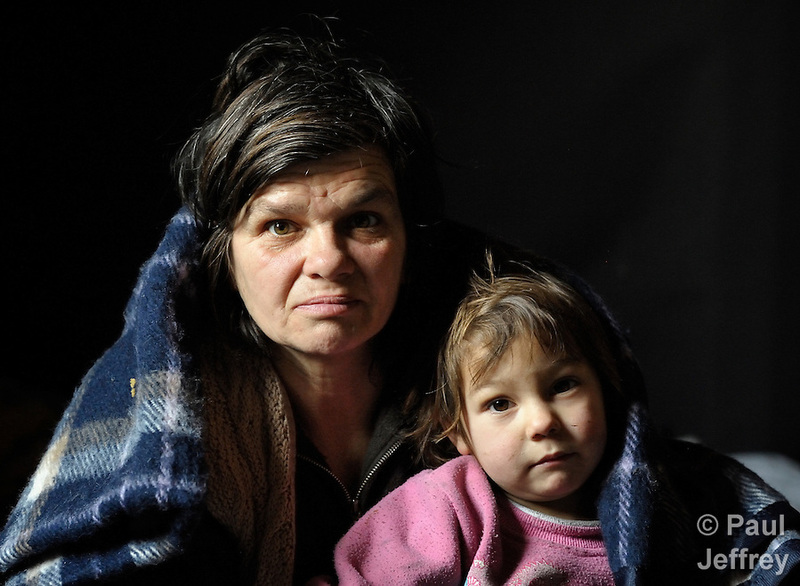 Arbanac and her daughter Caka were still huddling inside under a blanket provided by Church World Service. Because the warming weather arrived with me, the snow started to melt, and I spent a lot of time walking in standing water and mud. Each night I would cook my boots on top of the radiator in order to get them dry for the next day. Yet while my timing was unfortunate for my feet, it served well to see the desperate conditions of Roma settlements. Many Roma families live in homemade dwellings that are pretty meager in the best of times, and the onslaught of snow had collapsed roofs and flooded floors. In Smederevo, I walked through the Krivac Roma Settlement, one of the largest in the region, where even though some houses were flooded, the mail was still being delivered. Several families from Krivac had taken refuge in a shelter run by the Serbian Red Cross, with assistance from Church World Service. Life wasn’t too tough, as they had a swing set, and a little snow (or a lot of snow) never stopped a kid from swinging. In order to show ordinary Roma life, I spent one morning with Bajram Kruezi, a 14-year old who goes to the Branko Pesic School, an educational center for Roma children and families in Belgrade which is supported by Church World Service. I captured him eating breakfast, doing homework, then getting ready for school, his mother smoothing his hair and giving him a kiss, then leaving home, riding the bus, his day in class, and so on. Kruezi’s family are refugees from Kosovo, and thus lack full legal status. That keeps them out of regular schools, so CWS and other agencies sponsor special educational programs. According to one study, less than one quarter of Roma children in Serbia finish elementary school, only 10 percent graduate from high school, and many adults are illiterate. That’s why CWS supports educational work not just with children, but also with adults. Here’s Giltena Duda, a Roma woman in the Zemun Polje Roma settlement in Belgrade, studying for her adult literacy class with the Branko Pesic School, then a couple images of the class. Whoever said learning wasn’t fun? I worshipped in Jabuka my penultimate day in Serbia, after several days of participating in a conference of United Methodists who work with Roma throughout Europe. Fascinating group, and I came away with lots of ideas and contacts for a trip back to the region later this year. Stay tuned. Take a look at a gallery of selected images from this trip, including photos of younger Roma children in school and United Methodist worship services. April 4, 2012 | Filed under Blog, Europe, Refugees, Women. you sure do get around. thanks for the photos and commentary.heartwrenching , but they seem irrepressable (sp).community of esperanto? hope? Paul, Thanks so much for sharing!! The obvious message of need was transcended fo me by the message of transcendence.— clearly –to me–Love of life transforms what we might see as lacking to a world of Grace and Joy. Thank you Romas. As a American Romnichel (English/Irish Roma), thank you for these wonderful photographes that so capture the spirit of my people. I maintain the website for the Mississippi UMW and am trying to get some information together before the mission studies for the year begin. I would like your permission to use this article and photos on the website. Thanks in advance for your consideration! Thanks for all your photos. Do you have any information on/photos of the Roma in Romania? My husband and I will be volunteering at an orphanage there and want to learn all we can to understand something of what the Roma face everyday. I will be sharing what we learn with the UMW at our church here. Judy, Thanks for your note. Although I have been in Romania, I have not reported on any Roma themes there. I’d suggest you consult the EERC website, and use the search function to read the stories from Romania. That will give you a good introduction to some of the important issues that the Roma there are facing today. Thank you so much for sharing your experience and capturing the Spirit of the people and their issues. Blessings on your ministry and travels. My niece in Sweden recently adopted a Roma child from a Belgrade Orphanage. He appears to be an intelligent fine little boy who, hopefully, will do well in his new environment. Thank you for the pictures! I found them heartbreaking!